As skyscrapers rise, makers work to keep the city’s cultural spirit intact. Published on Tuesday, October 31, 2017. This article appears in the October/November 2017 issue of American Craft Magazine. The Firebird, Niki de Saint Phalle’s 17-foot sculpture, greets visitors to the Bechtler Museum of Modern Art. 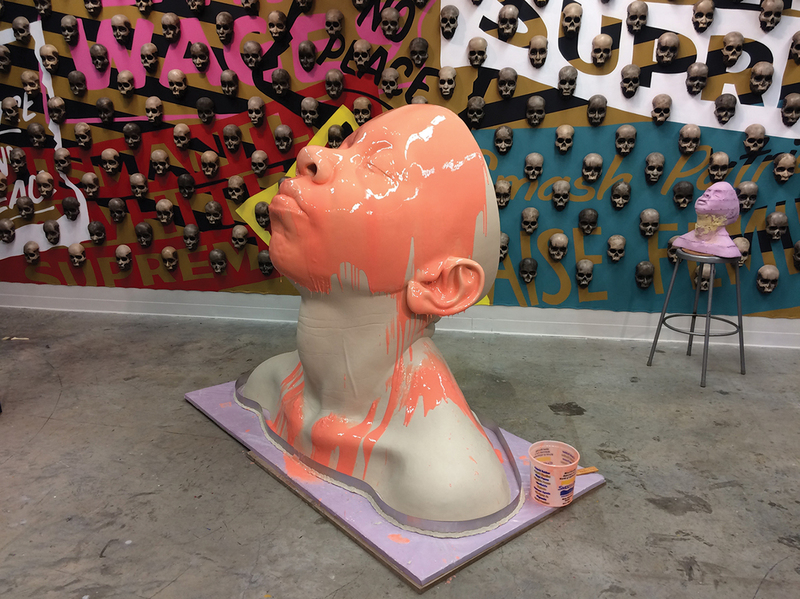 In a corner of his studio at the McColl Center for Art + Innovation, artist-in-residence Dustin Farnsworth unveils a life-size head and torso. Shapes like this form the bases of an ongoing series of sculptures, in which Farnsworth tops the classic bust format – human head and shoulders – with elaborate, weighty architectural headpieces. He had envisioned paying tribute to Charlotte’s architecture in a similar way, but after arriving in the city, he scrapped that idea. Charlotte is one of the fastest-growing cities in the country, and many of its older buildings have given way to shiny new office and residential towers. The skies above Uptown, the city’s hub, and nearby neighborhoods are dotted with construction cranes. The building boom is driving up rents and home prices. Finding affordable housing is a challenge for many — and finding traditional studio space that most artists can afford is almost impossible within the city limits. That makes C3Lab, a coworking and urban events space just minutes from Uptown, a rare find. In trendy South End, drone makers, drum makers, artists, and entrepreneurs coexist in what co-founder Glen Nocik calls “an investment in the community.” The organization provides private offices, maker spaces, a place for community events and workshops, and a kitchen and lounge. “The mission of C3Lab is to maintain the creative spaces and places where artists can continue to work and thrive,” Nocik said recently, announcing a merger and expansion with Union Shop Studio, another collaborative artist enclave. Kathie Roig, a longtime textile artist at C3, arrived from Asheville about two years ago. “Being new to the area, it was important for me to find a community of artists,” Roig said. She soon tapped into local arts organizations and was one of 20 local artists whose work was selected for display on billboards and other outdoor spaces. She also founded CLTextile, a new monthly gathering of weavers and other textile makers. 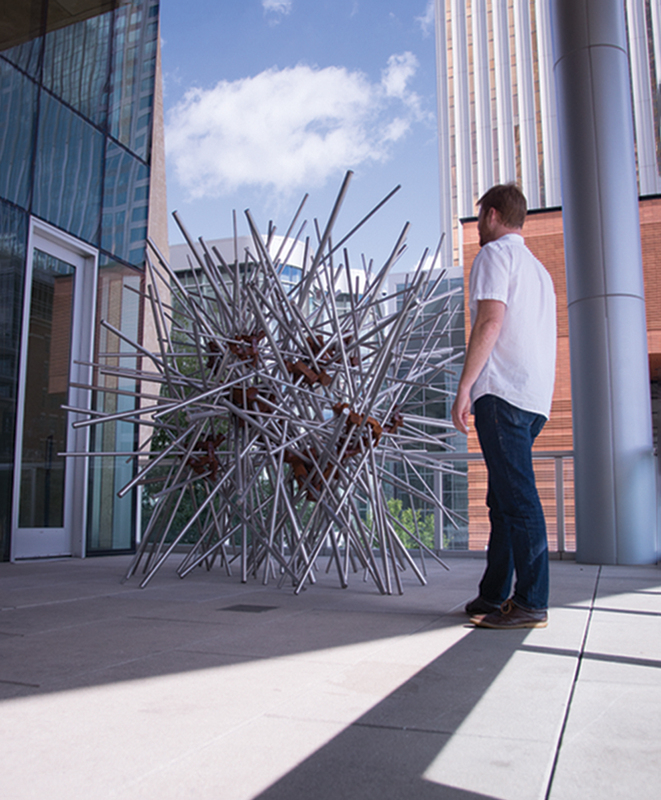 Charlotte’s art scene isn’t all about up-and-comers, though. Across town from C3Lab, Clayworks has been a place for ceramists to learn and grow for three decades. The organization recently celebrated its 10th year in the same East Charlotte location. Headed by potter Adrienne Dellinger, Clayworks consists of a 15,000-square-foot building that houses 28 studio artists, multiple kilns – including several raku kilns and a salt kiln – and 31 potter’s wheels. Shelves of finished and in-progress pieces line the walls. Clayworks instructors teach various techniques and forms to artists at all levels. Classes range from advanced hand building, which requires prior experience, to Muddy Fun Saturdays, where adult beginners can play around with clay. Clayworks does more than host classes, however. “Classes tend to fill to capacity, but the best way [for us] to expand is by working more with the community,” Dellinger says. The organization supports Second Harvest Food Bank’s Empty Bowls fundraiser and programs for adults with disabilities and kids, to name a few ventures. A mobile studio takes ceramic arts into underserved communities and schools almost daily. Headlining the Charlotte craft scene are the two locations of the internationally known Mint Museum, which has the largest public collection of North Carolina ceramics in the world. The main Mint, located in Uptown, has benefited from Charlotte’s building boom; a new facility that opened in 2010 is more than 60,000 square feet larger than the old one. “The Mint has must-see permanent collections – works from throughout the globe on exhibit at any time,” says Annie Carlano, the museum’s senior curator of craft, design, and fashion. The Mint expands on its collection with special exhibitions. 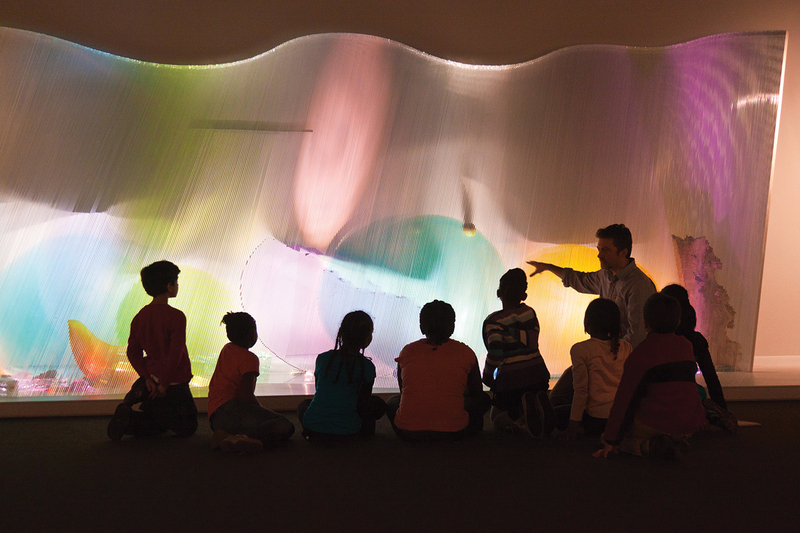 “Whoa – Windex!” shouted one boy as he bounded into “Fired Up: Women in Glass,” a recent collaboration between the Mint and the Toledo Museum of Art presenting glasswork by contemporary artists. This was not your mother’s glass cleaner, but a replica by artist Liza Lou, made of hundreds of tiny custom-made beads. Patrons young and old also enjoy the Mint’s Sunday Fun Days, which involve everything from hands-on art projects to family yoga sessions; the Randolph location hosts the annual Potters Market Invitational, which attracts more than 50 North Carolina artists each year. Charlotte may be changing, but thanks to institutions and individuals alike, it remains a craft hub. Rents are higher and space scarcer, but the can-do spirit of the city’s artists is still intact. For evidence, just lower your gaze from the big new skyscrapers and look around. A must-see for craft enthusiasts is the Mint Museum Uptown, which houses the Craft + Design Collection and includes the newly named Schiff-Bresler space devoted to fiber art. Head next door to the Bechtler Museum of Modern Art, featuring Niki de Saint Phalle’s Firebird, likely the most photographed work of art in Charlotte. Across from the Mint is the Harvey B. Gantt Center for African American Arts + Culture, whose Hewitt collection includes works by Charlotte native Romare Bearden and Elizabeth Catlett. The Sonia and Isaac Luski Gallery is home to a vertical garden by French artist Patrick Blanc and a sculpture garden featuring works by North Carolina artists Jodi Hollnagel-Jubran and Hanna Jubran. The McColl Center for Art + Innovation is located in a renovated neo-Gothic church where you can interact with artists while you explore their work. The Mint Museum Randolph, located just south of Center City, includes vast collections of ceramics and decorative arts. Head just north of Uptown to visit LaCa Projects, which specializes in work by contemporary Latin American artists. This area of town has attracted a growing, young, and vibrant population, which its art scene matches. The Charlotte Art League hosts the popular Starving Artist Market. A few blocks away, Ciel Gallery and Lark & Key Gallery and Boutique sit side by side, offering work by local and national artists. Finish up your tour at Elder Gallery, which showcases a diverse mix of American art, including ceramics, and runs a popular juried competition for North and South Carolina artists. Development has turned the NoDa historic arts district into an entertainment destination, but the spirit of local artisans remains alive with pop-up markets and shops like Ruby’s Gift and Pura Vida Worldly Art, which sell handmade art and fair-trade goods. The Clayworks Gallery features handmade pottery by faculty and studio artists. Visits to the gallery are by appointment only. Interested in woodturning? Head 30 miles north to Concord. ClearWater Artist Studios is home to the Southern Piedmont Woodturners, who host monthly demonstrations and special events. If you’re in the mood for a longer jaunt, take a three-hour drive west from Charlotte, where you’ll find the famed Penland School of Crafts, which exhibits and sells work by current and former instructors and students. If your interests run to pottery and more pottery, Seagrove is about a 90-minute drive east of Charlotte, where you can find plenty of shops, the North Carolina Pottery Center, and, every November, the Seagrove Pottery Festival. The McColl Center for Art + Innovation, housed in a neo-Gothic church in Uptown, provides studio space and hosts exhibitions. An in-progress clay bust by artist-in-residence Dustin Farnsworth has no top for strategic reasons. Charlotte’s love of the handmade extends to artisanal beverages. 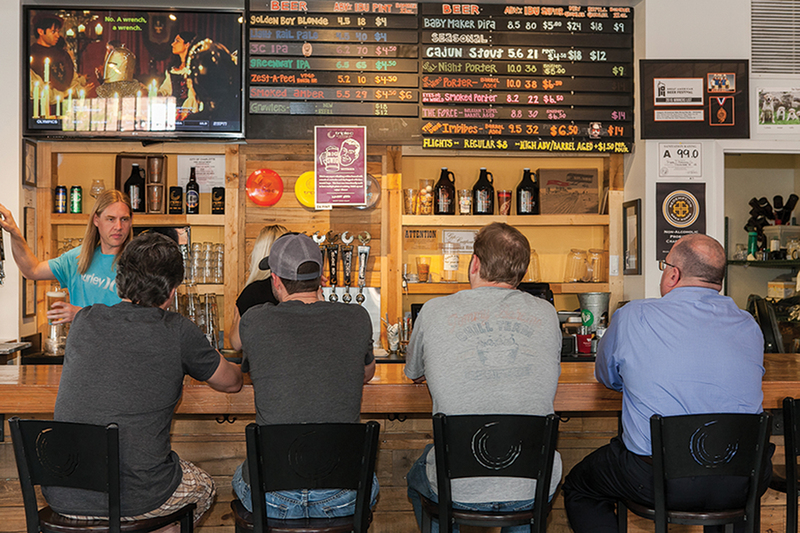 South End’s Triple C Brewing Co. is one of many craft breweries in the city. Located in South End, C3Lab features versatile spaces where makers can work on whatever comes to mind. 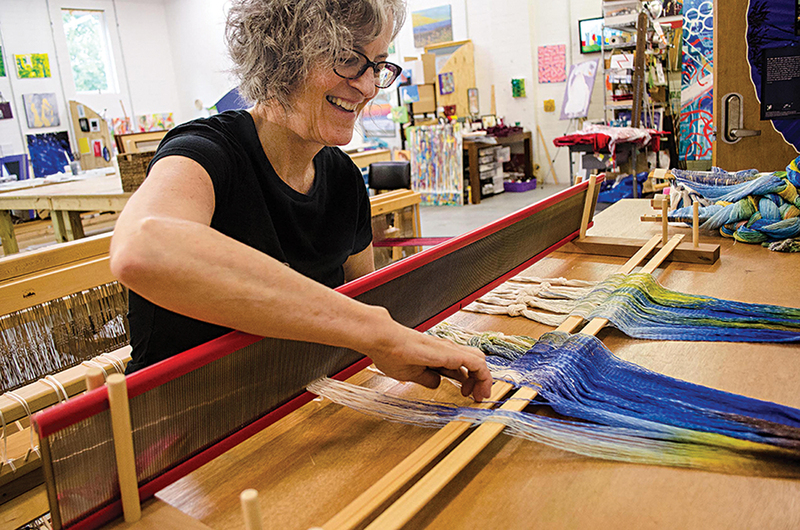 Textile artist Kathie Roig works a loom. 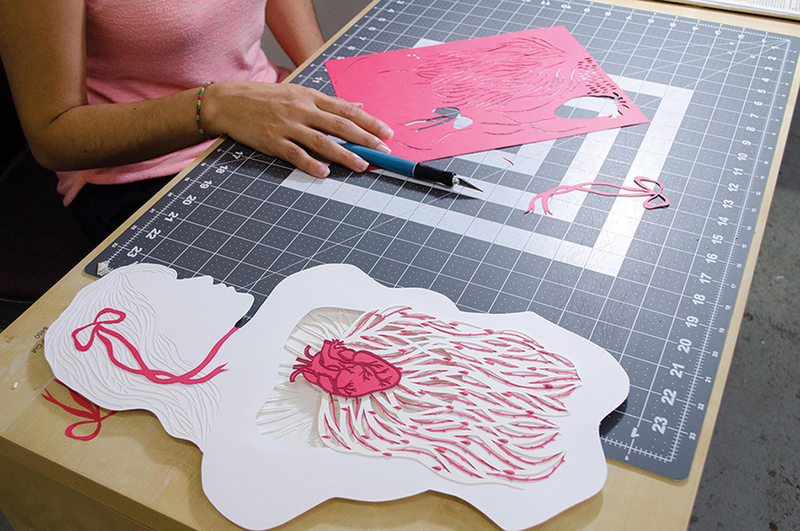 Karla Sosa cuts and layers paper to produce a 3D effect. 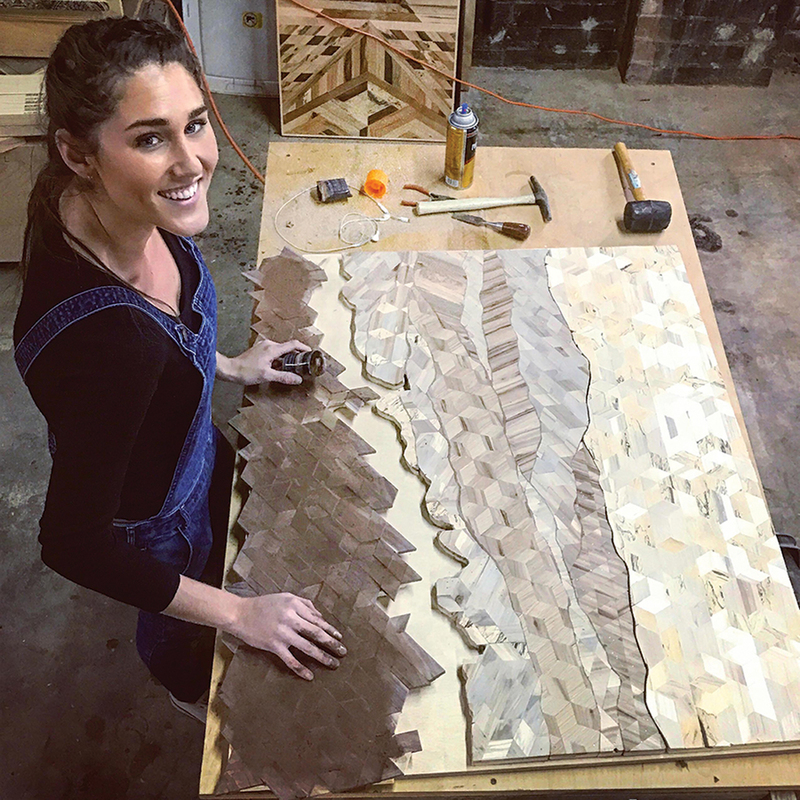 Victoria Angelini arranges wood pieces to produce a mountainscape. 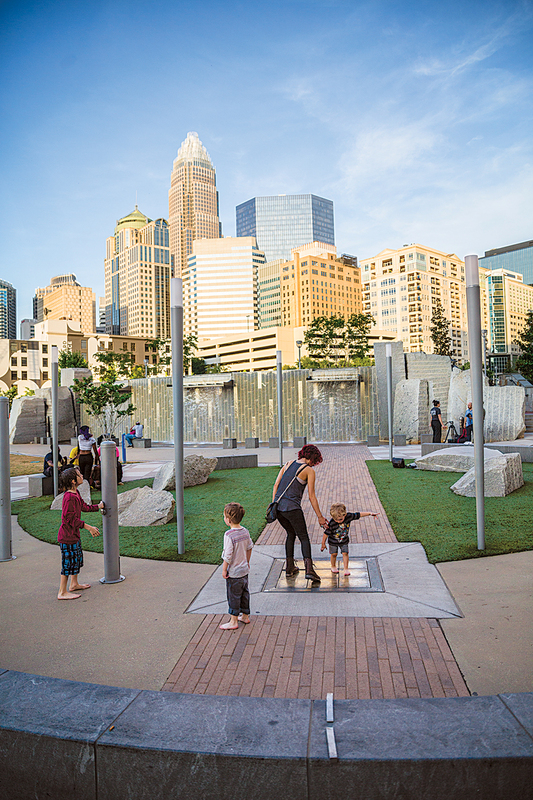 A popular family hangout, Romare Bearden Park, named for the renowned painter from Charlotte, affords a perfect view of the skyline. At night, colorful lights illuminate the stonework. Bearden’s work can be seen at the Gantt Center. With two locations – one in Uptown and another near Center City – the Mint Museum features an extensive collection, with craft and design heavily represented. Danny Lane’s glass Threshold (2010), commissioned by the museum, hangs outside the Uptown craft and design galleries. Tom Joyce’s Thicket (2015) sits on a terrace outside the entrance. 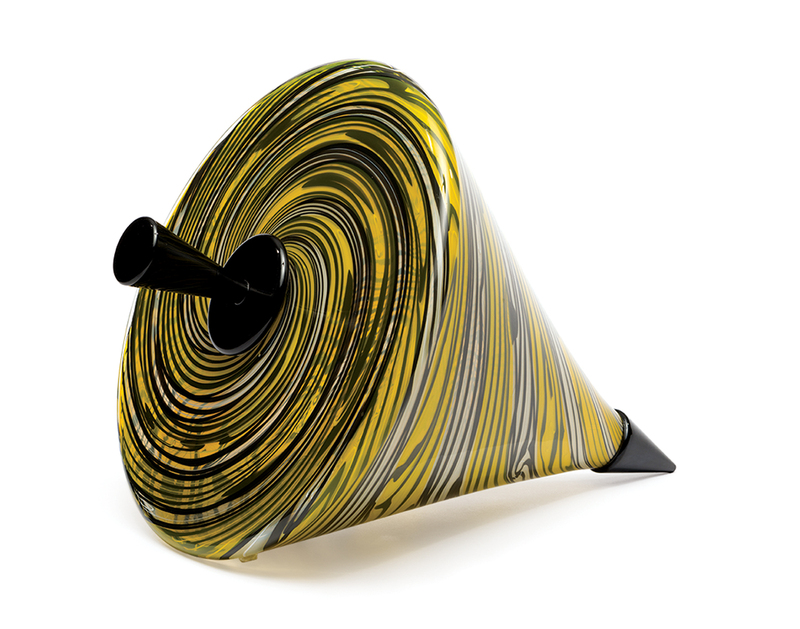 Nancy Callan’s blown-glass Tiger Top (2009).